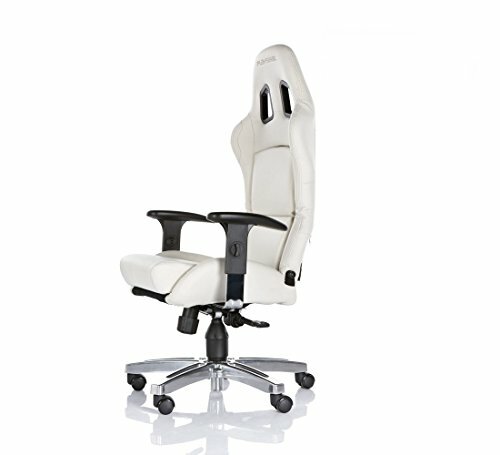 The Playseat Office Chair - White is built for comfort, sophistication, and durability. Constructed with high quality vinyl seat cover, it also boasts powder-coated steel frame with swivel mechanism. In addition, the height adjustable gas spring design and anodized aluminum legs offer utmost user comfort and stability while the caster wheels provide smooth mobility. Recline the backrest with the tip of your finger, it also boasts a foldable seat. Ideal for use at home, office, showrooms, meeting rooms, game rooms, etc., it also comes packed with 90 days manufacturers warranty. Hurry now and bring home the Playseat Office Chair - White! Great For Use At Home, Office, Game Rooms, Showrooms, Meeting Rooms, Lounge Areas, Etc. If you have any questions about this product by Playseat, contact us by completing and submitting the form below. If you are looking for a specif part number, please include it with your message.